An RIT student demonstrates use of the Oculus Rift virtual reality headset. 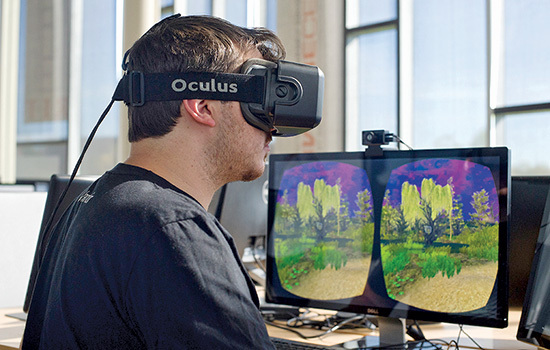 RIT students and faculty working in a variety of disciplines have studied virtual reality as a way to enhance the user experience in game design and development, film and animation and imaging science. In January, the Center for Media, Arts, Games, Interaction and Creativity (MAGIC) will serve as a home base for developers and practitioners who are at the forefront of emerging virtual/augmented reality technology. A new virtual/augmented reality lab, which will be temporarily located in Student Innovation Hall and eventually moved to the future site of MAGIC Spell Studios at RIT, will be dedicated to enhancing the content of virtual/augmented reality platforms in order to provide users with top-notch experiences. Faculty affiliates, student teams and university collaborators will have access to development facilities, hardware platforms and other experimental devices that utilize motion, touch and sensory interfaces. Opportunities will be available throughout the year for the general public to experience virtual and augmented reality interfaces firsthand. Virtual reality—also referred to as immersive multimedia or computer-simulated life—replicates an environment that simulates physical presence inside real or imagined worlds. It even can recreate sensory experiences, including virtual taste, sight, smell, sound and touch. Virtual and augmented reality are among the hottest trends in the industry right now, particularly with the uses of software and hardware such as the Oculus Rift headset or Microsoft Hololens, according to Andrew Phelps, director of RIT’s Center for MAGIC. He believes that the center will play a crucial role in the newly emerging area of content development for these VR/AR platforms and will help fuel the connections among collaborators in computing, the arts and humanities, among other disciplines. Earlier this year, students in RIT’s School of Film and Animation developed a virtual reality movie using the game engine Unity—a powerful development tool for creating multiplatform 3D and 2D games and interactive experiences—and 13 GoPro Hero3 cameras. RIT’s imaging scientists are also making inroads in the virtual/ augmented reality fields with the further development of complex image recognition software built to enhance the user gaming experience. Last February, RIT game design and development graduates Preston Johnson and Doug Lynn published their game A.V. on Steam, the world’s largest digital game distribution platform, with support for the Oculus Rift virtual reality headset, a feature that was promised to users in the initial design stage.